Lake City-based Hunger Intervention Program works to bring food to local families through its Healthy HIP Packs Program, free summer meals for kids, and by advocating for hungry families. 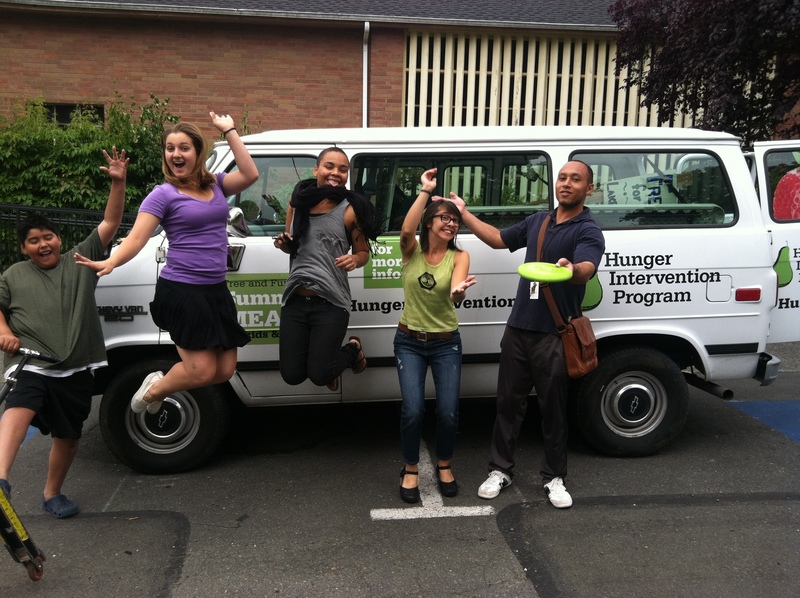 Thanks to United Way King County, HIP has four awesome summer meal interns this summer. They are part of United Way’s One Million Meals Campaign that is aiming to increase participation in summer meal programs. In 2012, only 9% of kids and teens who qualified for free or reduced price meals during the school year took part in the summer meal program. Part of the difficulty is a limited number of summer meal sites. Another barrier is getting the word out to kids and teens. Fiona, Breanna, Sam, and Joshua (pictured below in order) are all here in Lake City this summer to address these two issues. 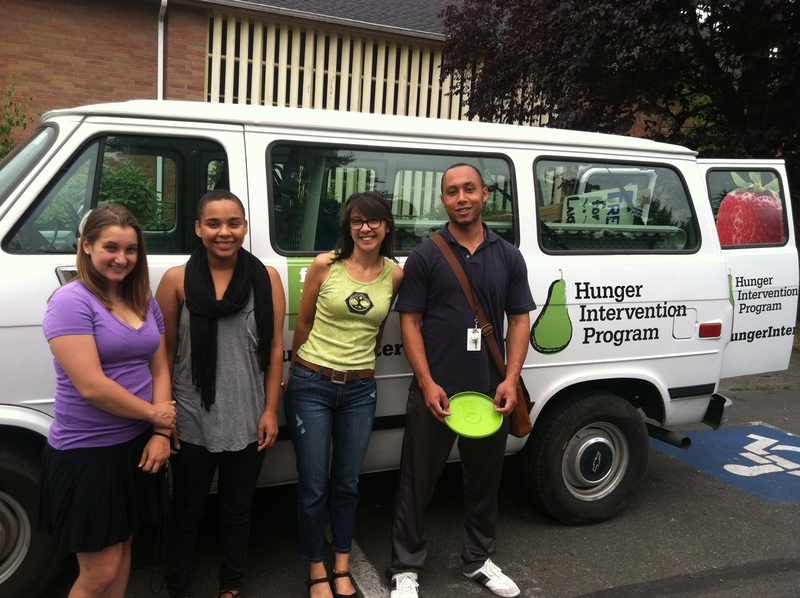 Every weekday, they can be found at HIP’s FOUR summer meal sites. The rest of the time, they are out and about spreading the word of summer meals for kids. Get to know them better below, come join us at a meal site, and look for them with the HIP van in the Pioneer Days Parade this weekend. Fiona Stefanik is a rising senior at the University of Washington, where she majors in anthropology and French with a minor in global health. When she grows up, she’d like to go to grad school for either anthropology or dance – or both, as she’d love to focus on anthropological dance research. This summer, she’s working on the Million Meals Campaign with HIP because, after three years in college, she has come to think of Seattle as her home, and she wants to give back to the community that has embraced her. As the newest member of the HIP summer meals team, Fiona is excited about the offer versus serve meal option, increasing numbers at the Jane Addams site and getting to know the regulars. She is also interested in learning more about how nonprofits navigate bureaucracy. Breanna Hudson is currently a student at the University of Washington where she is majoring in geography. She plans to attend graduate school for geography or urban planning and would like to be a teacher because she will have a summer break for life. A resident of Seattle, Breanna notices considerable class privilege, particularly in the college atmosphere. Breanna also participated in the Summer Meals program as a child. Because of these reasons, she is working with HIP to give back to and interact with the community she feels a part of. A favorite aspect of her meal site at Lake City Community Center is the built-in sense of community. Many people who come already know each other so Lake City Community Center is not just a meal site, but a place for the community to gather and interact in solidarity. Unique, but nevertheless important, lessons Breanna learned are that kids don’t like milk as much as she expected and to never leave children unattended with Play-Doh. A graduate of Western University, Samantha Heim is currently living in Ballard while saving up money to travel to Europe. She chose to work with Hunger Intervention Program because she wanted a summer job dealing with food security and an opportunity to gain further insight into the operations of a nonprofit. Her site is located at Viewlands Elementary. One thing she enjoys about her site is the sense of community and school spirit. Many of the families coming to the meal site attend Viewlands during the school year and come to the site for the meal and to meet new and old friends. Experiencing the Summer Meals Program, Samantha has learned how to navigate through the difficulty of logistical food operations and the role nutrition has in community development. She observes, “People getting access to nutrition is much harder than I previously thought.” The skills she would like to take from this experience include outreach, planning events, and working with kids. Samantha is happy to be working with HIP. A recent graduate of the University of Washington, Joshua Aresenaux majored in Political Science. His first job was working as a treasurer for the Cascadia Community College in Bothell. His long-term goal is to attend law school. 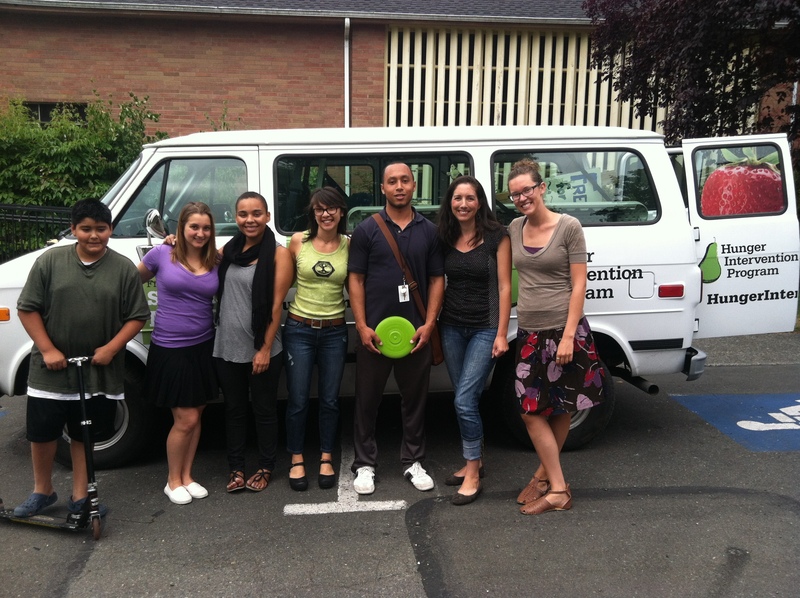 Joshua enjoys working with the Hunger Intervention Program because he is attaining more experience working with children. It has also given him the opportunity to talk with people who receive the free meals, and gain a better understanding of the under resourced communities he is working with. Joshua hopes this summer experience will provide him with valuable skills which he can apply to his next AmeriCorps position, working with the Bothell Youth Court. He hopes to focus on restorative justice practices, helping to provide a productive alternative for at-risk youth. Joshua said his favorite thing about working at the Lake City Court playground is the freedom and imagination which fills the park when the kids play. Shout out to our superstar volunteer James, who helps us pack up every morning and leads activities at the Lake City Court meal site. Lastly a shout out to Olivia Price, who interned with HIP for the first four weeks of the summer. A recent Public Health major from UW, Olivia helped to get the Jane Addams meal site up and running. She’s remembered by her fellow interns for her love of 80’s music and her artistic skills, particularly with face painting. ← Calling all HIP volunteers!